Last week, the Italian police raided the home and science laboratory of Drs. Antonietta Gatti and Stefano Montanari. The police snatched all of the digital assets owned by the husband and wife team of nanopathologists, grabbing laptops, computers, and flash-drives—and with it years of work and research. Because Gatti and Montanari had taken their research of nanodust and nanoparticles, from in-vivo (performed in a living organism) and in-vitro (performed in a test tube) to what unseen contamination might reside in vaccines in 2016, they came under the microscope of the United States, Europe, and Italian authorities. They had touched the third rail of medicine. They had crossed the no-go zone with the purported crime being scientific research and discovery. By finding nano-contamination in random vaccines, Gatti and Montanari revealed, for the first time, what no one knew: Vaccines had more than aluminum salts adjuvants, Polysorbate-80, and other inorganic chemicals in them, they also harbored stainless steel, tungsten, copper, and other metals and rare elements that don’t belong in shots given to fetuses, pregnant women, newborns, babies and toddlers developing their lungs, immune and nervous systems. Click to read our report on this study. 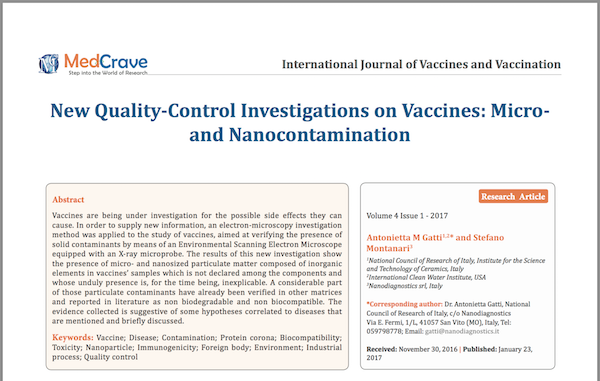 When the scientists published their findings in January 2017, New Quality‐Control Investigations on Vaccines: Micro‐ and Nanocontamination, the logical next step for the World Health Organization (WHO) and the Centers for Disease Control (CDC) should have been to open an investigation into their claims, hire independent scientists to run their own lab tests to confirm or refute the findings. If confirmed, then the medical gatekeeper agencies would enact new policies on safety of the vaccine supply chain, and enforce strict quality control and quality assurance programs. But none of that was done. A year went by. It was cheaper for the authorities to attack the Italian scientists, than upset the vaccine gravy train that supports the politicians. Safety improvements are what ultimately happened to the motor vehicle and tobacco industries. But none of that has taken place with vaccine safety. Why? The so-called gatekeepers of healthcare are in bed with Big Pharma and mainstream media—which Pharma owns through its powerful advertising purchases—that vaccines have become a taboo subject. The media simply won’t investigate any negative vaccine stories. Today, debating vaccines in public is frowned upon and demonized. 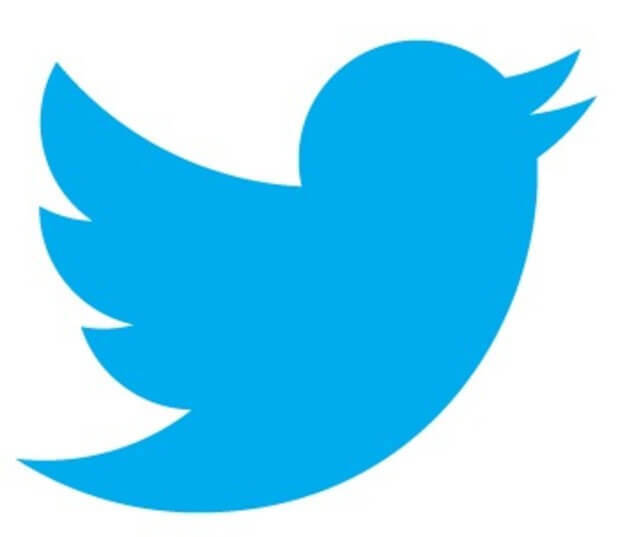 Add to the failure to inform the consumer the 2018 censorship by algorithm in Silicon Valley from Facebook, Twitter, and Google/YouTube and the next bulwark that consumers, concerned doctors and scientists have to overcome in sharing information and scientific data is firmly in place. Pile on the opioid crisis and millions of children overmedicated, and the death of logic is unabridged. What can be done to bring transparency to the murky world of Big Pharma medicine and vaccine manufacturing, with government agencies failing to address real concerns and social media deleting free speech and public discourse. In the fallout of the 2008 financial crisis, trust between consumers and the big banks and the federal government was broken. Instead of letting the markets and bankruptcy courts decide the fate of the overleveraged financial institutions, they were effectively bailed out. No one, other than exposed Ponzi schemers, was arrested, let alone went to prison. The incestuous nature between the federal government and Wall Street banks was laid bare. As a result, one technologist or a group of them had seen enough bad policy and worst enforcement. Satoshi Nakamoto published a 9-page brief, Bitcoin: A Peer-to-Peer Electronic Cash System, (https://bitcoin.org/bitcoin.pdf), that challenged the century-old policies of the Federal Reserve and central banks plying people and businesses with debt like a cheap drink. They allowed the banks to count the same dollar multiple times at the close of each trading day. They added trillions of dollars of more debt in the Quantitative Easing program, which has only inflated the next bubbles to burst one day. Bitcoin, along with other cryptocurrencies, is upending the old way of big banks conducting business. The threat of disruption goes far beyond the banking industry. The underlying technology of Bitcoin is blockchain—a distributed public ledger of peer-to-peer transactions. Coming into its own as the Web 3.0, blockchain will transform every business process and sector in the Digital Age. Blockchain’s two main use cases are efficiency and trust. It’s efficient in that it will eliminate the middleman, from fine art and diamonds, to purchasing houses and motor vehicles. It’s also a “trustless” system, in which blockchain’s public audit trails are traceable to the original owner or smart contract, thus instilling an immutable trust in a process or transaction, which didn’t exist before. The democratization and decentralization of data will empower consumers and small to medium size businesses to bypass the gatekeepers of an industry, government agency, central bank, corporation or social media platform. They will no longer hold exclusive control on data and information. Transparency is king. Everyone will reap the costs and time savings of radical efficiency. Today, there are several health projects launched on the blockchain. They are industry-driven, from insurance and healthcare providers, yet are not drilling down to individuals. Why do hospitals, doctors, and dentists hold their patients’ healthcare records in separate databases, but not the people who own that information? Not trusting the CDC, for its deliberate cover-up of the Agent Orange studies in the 1980s and hiring of mercenary scientists to cook vaccine safety data, it’s time for individuals to stand up and create their own blockchain projects, free from government interference, free from medical institutions beholden to Big Pharma, and free from the mainstream and social media’s censorship practices. The blockchain use case for scientists like Gatti and Montanari in the future would be to keep their critical digital assets in a digital vault outside of Italian so that the next time scientists are raided by the police their lifetime of work wouldn’t be lost—confiscated, sure, but easily retrievable online. 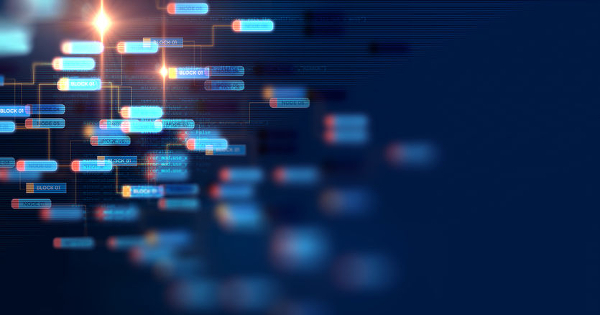 Thus, the blockchain would not only secure those digital assets, but also provide a unique traceable audit proving those files belonged to them, ensuring data integrity. Other blockchain use cases would be to trace the origins of vaccines from raw materials, such as the incubation of eggs and media that viruses are grown on, to every step in the manufacturing process and supply chain down to the local doctor’s office or pharmacist, who administers the inoculation. Perhaps the biggest blockchain use case would be to for individuals, while maintaining their privacy, to upload adverse reactions to vaccines and medicines, including follow ups and treatments for their injuries. That blockchain project would fill a massive void on the absence of such data, since more than 90 percent of doctors and hospitals don’t enter that information even when it’s reported. The revolution isn’t confined to banking. Blockchain will transform how people collect, track, and share their health data around the globe. And that will frighten the healthcare gatekeepers, showing they are no longer the sole arbiters of their personal information. James Grundvig is an investigative journalist coving topics from renewable energy and technology, to health and the Autism epidemic. He is a father of a teenage son on the spectrum. As an author, his debut book Master Manipulator: The Explosive True Story of Fraud and Embezzlement at the CDC, breaks open the Poul Thorsen circle of corruption. Photo courtesy of James Grundvig. TLB wishes to extend our sincere gratitude to Sayer Ji and the staff at Green Med Info for making this pertinent information available.